Ability Wood Flooring is an all-American company that’s been in business for more than 65 years – and is still thriving today. A family-owned-and-operated business manned by three generations under the same roof, we work hand-in-hand to showcase the outcome of hard work and continuous service excellence. Our best kept secret to being in business this long is adapting to the changing climate of newer technologies and products in the marketplace. With this approach, we’ve continuously delivered the most in-demand flooring solutions to homeowners and businesses in Lake Nona. We’re always one step ahead of groundbreaking innovations, just like custom flooring Lake Nona that can be manufactured in any material or design you want – within reason. Wood Flooring Orlando FL – From solid hardwood flooring to engineered options, there are tons of choices to cherry pick from. Tell us the hue, grain, and pattern preferred, and we’ll customize wood flooring to fit the listed specifications. Tile and Stone Flooring – Get durable and stunning tile or stone flooring. From porcelains to ceramics designed to replicate the look of wood, or authentic travertine or marble tiles, our wood floor installation company in Lake Nona carries it all. Floor Restoration – Transform older hardwood floors into modern marvels. Ability Wood Flooring’s sand and finish process is as detailed as it gets. We can even provide more dramatic results, including a new color change or patterned design. Just ask! Bathroom Flooring – Live the dream by starting and ending your days in a luxurious bathroom haven decorated with top-of-the-line flooring. Kitchen Flooring – Gather around with family and friends in an awe-inspiring kitchen environment, featuring well-appointed hardwood, tile, or stone flooring. If you have an idea of what you want your floors to look like, we can make it happen at Ability Flooring. We recommend stopping by our flooring boutique when you have the time to do a quick consult. Alternatively, you can email or text us your sketches and we’ll do a follow-up with you to discuss pricing and other details. Perfect for universities, hospitals, and other places of business, put your brand in the front and center of entryway floors. 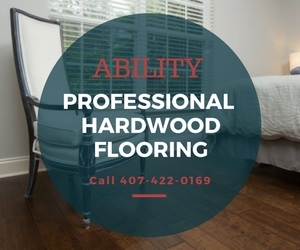 Ability Wood Flooring can recreate insignias on all types of flooring, including tiles, hardwoods, and more. Who knew an independently owned flooring boutique in the area had so many options? Do you want to stick with traditional tile and stone flooring – but also want to interject an element of surprise in the design? Consult our in-house flooring designer at Ability Wood Flooring for custom floors that turn heads.